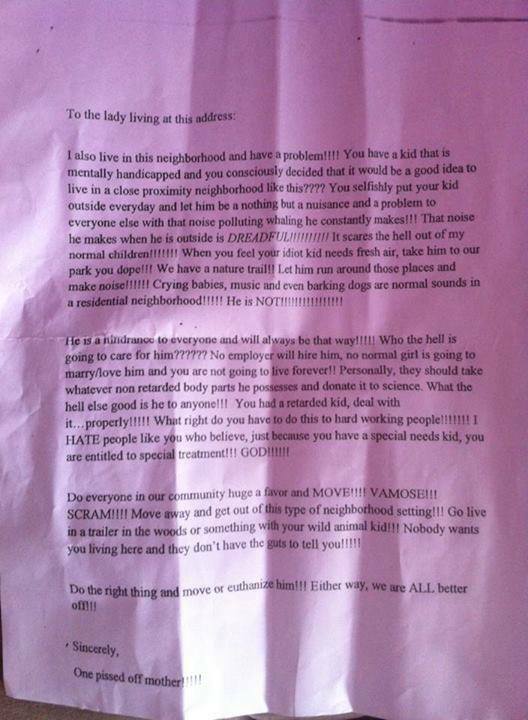 A photo of hate letter towards a Canadian teen with severe autism and his family has sparked outrage over facebook after being shared over 30,000 times and counting. The anonymous letter was delivered to Max’s grandmother’s house, where he often spends mornings in the summer. Signed by “one pissed off mother”, the letter personally attacked Max’s worthiness in life, as well as his family’s choice to let him enjoy bouncing a ball in the backyard. “You selfishly put your kid outside every day, and let him be nothing but a nuisance and a problem for everyone else. …that noise he makes when he’s outside is DREADFULL! It scares the hell out of my normal children”, the letter read. Max’s mother Karla Begley, who has secondary progressive multiple sclerosis, gave an emotional interview to Canadian news source, CityNews. “The more you go on [reading], the worse it gets”, she said. “Personally, they should take whatever non-retarded body parts he possesses and donate it to science”, the letter continued. Police Spokesperson, Dave Selby said that the letter has been forwarded to the Crown Attorney’s office for further investigation. “Obviously it’s a concern for anyone who would read it, for us though, it takes that next level in terms of determining whether there’s an offense in here or not”, he said. You can see the original Facebook post here.